A variety of addition activity cards to help students write number sentences, find the missing number and adding two colors to find the sum. 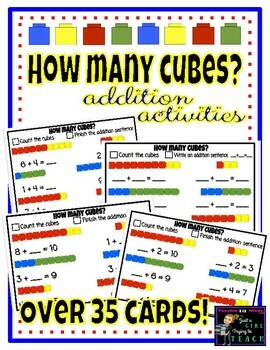 This activity is great for small group, exit slips, independent work or centered based learning. 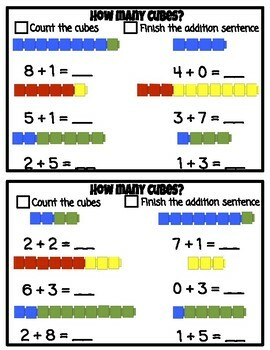 These colorful cards are a great resource to help students with learning addition to 10. I personally use these cards in my classroom. I laminated each card (back to back- to save space) and have my students write the addition sentence in their notebooks or use dry-erase marker. 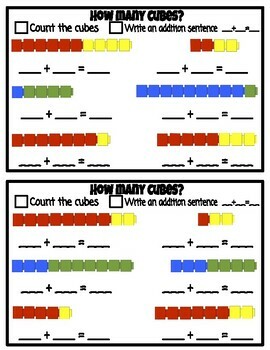 The students love to use these if they finish work early or within small group!